Raymond D. Adams, the perennial Chief of Neurology at Mass. General, taught his residents that the initial step in order to make a clinical diagnosis was to localize the lesion. In terms of autism, the presence of abnormalities in language, socialization, executive functions and seizures is clearly suggestive of some type of deficit involving the cerebral cortex. The types of symptoms and their severity also suggest that involvement should be widespread and quite apparent. The cerebral cortex is the part of the brain that processes information from our sensory modalities and allows us to react accordingly. Anatomical variations within the cerebral cortex could account for two people, one neurotypical and another autistic, to receive the same sensory information but to experience and interpret the same in different manners. Still, until a few years ago, looking under the microscope for any such abnormality(ies) was an exercise in futility. It is unsurprising that the pioneering scientists Margaret Bauman and Tom Kemper, using postmortem (autopsied) tissue, found little in the cerebral cortex and focused their attention on subcortical structures and the cerebellum. Tony Bailey was the first researcher to call attention to this area of the brain as being involved in autism, but his findings were difficult to interpret. According to his results there were a myriad of neuropathological events involving the cortex that varied according to patient. 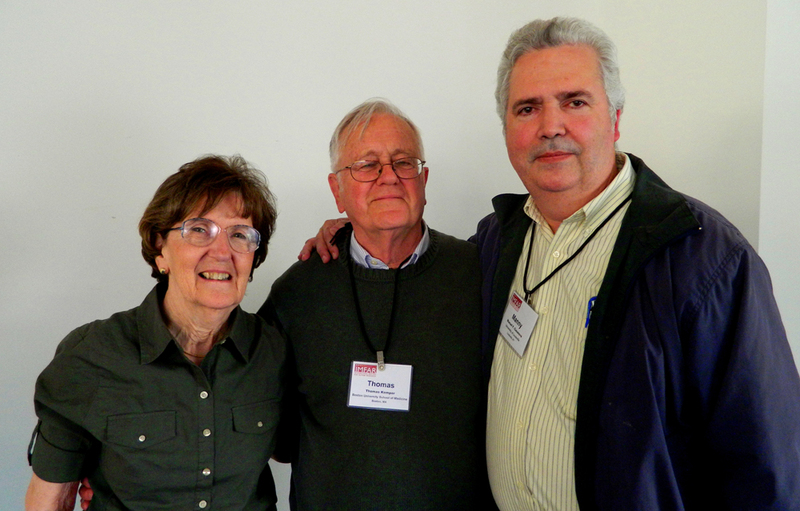 Margaret Bauman, Tom Kemper and myself at a recent meeting. I was a consultant in Margaret Bauman’s failed grant (mid 1980’s) to study the brain in autism. My role was to provide brain tissue that at the time was quite sparse. Later on I became a member of the founding board for the National Alliance for Autism Research (NAAR, now Autism Speaks) and the Autism Tissue Program (ATP). It just so happens, that years later my grandson was diagnosed as having the behaviors typical of autism. Karma? I do not know. Just to say that I have had a lot of time to think about the condition and after many years of hitting my head against the wall, I decided that the field needed a “paradigm shift” in order to move forwards. My own realization was that pathologists could have been missing abnormalities of the cortex by focusing on visualizing changes at the cellular level rather than on how these cells were organized into circuits, i.e., minicolumns. In a previous blog (An Introduction to Cortical Modularity) I provided some ideas about how the cerebral cortex is organized. During my tenure at Johns Hopkins I was heavily influenced by a giant within the field of neurophysiology: Vernon Mountcastle. The main claim to fame of this great neuroscientist was the columnar organization of the cortex. It was because of his influence that I decided to study this element of anatomy (minicolumns) within the brains of autistic individuals. My first attempt at examining minicolumnar arrangements in the cerebral cortex of autistic individuals was facilitated by Margaret Bauman and Tom Kemper. My old friends hosted me at their laboratory for one full week during which I examined their brain collection and took plenty of photomicrographs. (Is it too late to give thanks?) Their collection was almost unique in consisting of full brain sections that had been imbedded in a cellulose medium called celloidin. Embedding in cellodin avoided using heat and created little in terms of artifacts or tissue shrinkage. 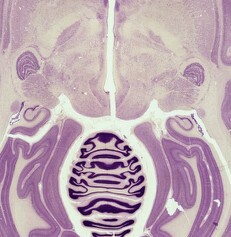 The cellodin slide of a brain shows the amount of resolution and preservation of anatomical detail that you can obtain with the technique. Back at home I was able to analyze the photographs using computerized image analysis methods. Our study revealed marked minicolumnar abnormalities in the brains of autistic individuals. More specifically, the columns were smaller than normal with most of the diminution being found at the periphery of the structure. By the time our first study was published, we had already reproduced our results using a different technique (gray level index) and had acquired plenty of data on the specificity of the findings. In essence we had analyzed a number of different populations (e.g., Down syndrome, schizophrenia, tuberous sclerosis, Rett syndrome, rubella babies) and found that the previously reported results were specific for autism. The only similar population came from data on 2 brains from individuals with Asperger’s. In these cases, Asperger’s and autism, there were differences of degree, not kind. Patients with Asperger’s exhibited the same abnormalities as those with autism, but appeared to be less severely affected. We also reported similar abnormalities in the brains of three distinguished neuroscientists (a neuroanatomist, a psychiatrist, and a neurologist) all world renowned . We will comment on the latter findings in a future blog. Years after our initial publication we were able to reproduce our results in a multinational double-blinded study sponsored by the Autism Tissue Program. Additional studies qualified the nature of the minicolumnar abnormality. In one notable example we were able to trace the minicolumnar abnormalities throughout all layers of the cerebral cortex. The importance of these findings will be discussed in future blogs. As a way of introduction I will be discussing how, based on these findings, we can implement therapeutic interventions (e.g., transcranial magnetic stimulation), define a different pattern in the blueprint of cortical connectivity in autism (which can be used for diagnostic screening), and talk about possible explanations for some of the core symptoms of the condition. I will also be talking about how we can tie all of the loose ends within the literature of neuropathological findings in autism, and what seems to be a suitable explanation for all of the findings. Yes, I’d be interested in hearing about that, I wish I knew more about what was wrong with my brain (I’m high functioning autistic). I don’t know about Bailey, but I thought Bauman and Kemper’s findings clearly showed purkinje cell loss in various parts of the cerebellum like the inferior olive and deep cerebellar nuclei, though the vermis was intact. I thought that norepinephrine cells and perhaps the locus coereleus might be damaged in autism because the dorsal tegmental bundle goes from the locus coereleus to the cerebellum and hippocampus and purkinje cells use norepinephrine (as well as GABA) as their neurotransmitter. But I guess I might be gasping at straws from a limited knowledge of neuroscience since I guess your own work points more to GABA than norepinephrine from what little I know about it. You are quite correct. Bauman and Kemper main findings were in subcortical structures and the cerebellum. In regards to the significance of Purkinje cells reductions, I have already debated this in the literature and will make it the object of a future post. Thank you again for following the blog. I think your research of minicolumns in autism explains a lot of autistic phenomena (esp. sensory perception) and makes perfect sense. But I’ve always wanted to ask you about co-morbidity, e.g. autism and Down syndrome. You write that the analysis and comparison of a number of population, including with Down syndrome, showed that the ‘marked minicolumnar abnormalities’ were specific to autism. However, Kent et al. (1999) estimated that about 7% of children with Down syndrome also have ASD. Does it mean that these children have the same minicolumnar abnormalities as individuals with autism do? I think that the mechanism that propitiates autism is open to many different types of insults. I am hoping to write about this in a future series of articles under the heading of a locus minoris resistentia. Just to say that some genetic abnormalities (TSC, Erlher-Danlos), viruses (CMV), drugs (cocaine during pregnancy) and risk factors (extreme prematurity) may have more in common than imagined. Thanks for the comments.